Entry-level Zen. 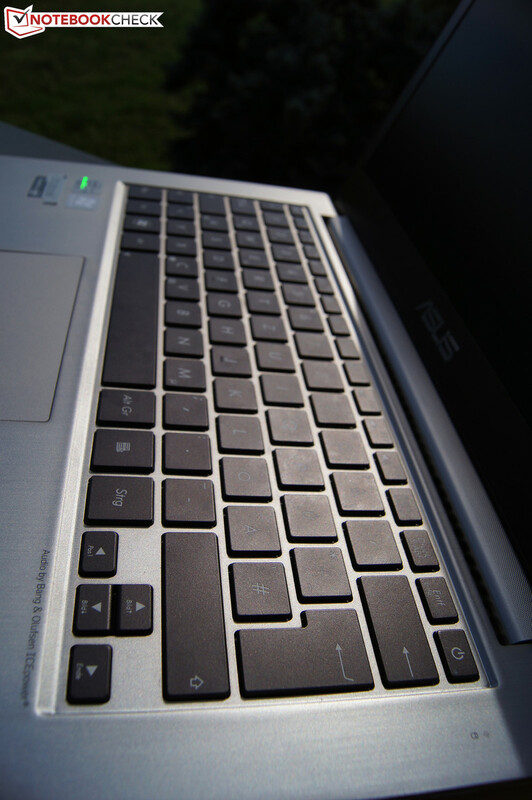 Asus has been one of the first out of the blocks when dipping their hands into the ultrabook market. Now, with the UX32A-R3001V, it wants to rock the low-priced competition offering the laptop at around 800 Euro (~$1050). Our test shows how successful it is. 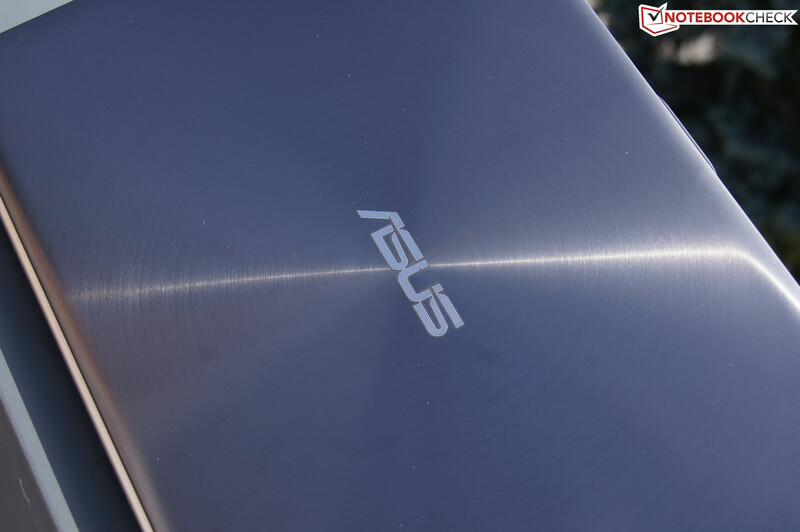 Asus has made a number of versions of the ultrabook trying and testing different options internally until it could produce an acceptable design. Matching examples from the Zenbook range would be the UX31A or even the UX32VD. Both give the potential buyer a well-built, very stable and at the same time, an extremely thin aluminum casing and a 13 inch screen - that even incorporates Full HD resolution. 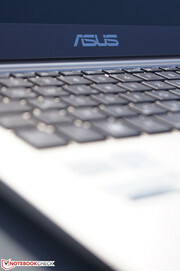 However, the above named ultrabooks are at a price range of just over 1000 Euro (~$1300). 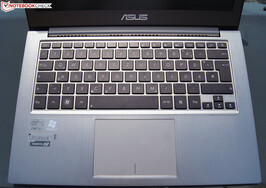 Until now, Asus did not have much to set against the entry-level competition of around 800 Euro. Here we find Lenovo's Ideapad U310, just like Acer's Aspire S3 and Fujitsu's Lifebook UH 572 which are all powered by a Core i5-3317U. Let us find out whether the UX32A can convince with the slightly slower Core i3-2367M from the older Sandy Bridge generation. and high stability despite the slim dimensions and low weight. The charcoal-gray and aluminum-silver ultrabook's brushed surfaces (circular on the top, otherwise linear) give the buyer a few good looking features. Despite narrow, almost fragile dimensions and low weight (approximately 1.5 kg or 3.3lb. ), the chassis comprised of an aluminum-plastic composite that provides a high degree of stability, even in the area of the rigid lid. It can be opened to an angle of 130° even with one hand and stays in position without any wobbling. It is commendable that Asus uses this impressive casing even for its cheapest Zenbook version. We can say that the case construction is one of the best for an ultrabook in this price range. Like in the UX32VD, Asus does not install any slow USB 2.0 ports and treats our Zenbook to three USB 3.0 ports. One is located on the left and the other two on the right of the slim base unit. The ports on the right are a bit too close for comfort, but they can both recharge smartphones when the laptop is turned off (powered USB). 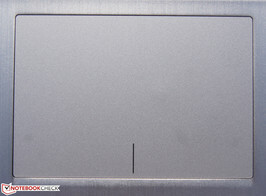 MMC/SD(HC) cards can be inserted in the slot on the ultrabook's left. It is possible to connect headsets or speakers to the combined microphone/headphone jack on the right. Monitors and projectors (right) are either connected via HDMI or mini VGA via the included VGA adapter. Intel's Centrino Advanced N-6235 connects the UX32A to a/b/g/n Wi-Fi networks and supports the proprietary Wireless Display technology in addition to Bluetooth 4.0. 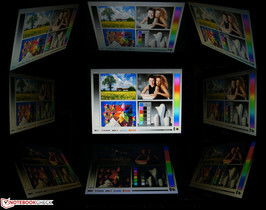 Screen content can be transmitted to corresponding monitors and flat screens even without cables. An included USB to LAN adapter enables cabled connections to LAN networks. In addition to a very high-quality looking but thinly padded laptop sleeve, the compulsory user's manuals and the two aforementioned adapters (USB-to-LAN, mini VGA-to-VGA) are found in the slim, elegant box. Beyond that, Asus also includes two small Velcro cable ties sporting a printed logo. A total of 12 Torx screws separate us from the UX32A's innards. After they have been removed, the entire base plate can be lifted off and all innards can be accessed. This will likely please every savvy user. No matter if its is general maintenance or exchanging parts, everything is quick and easy. According to Asus, it does not void the warranty. Like other Zenbooks, the UX32A is sold with a two year pick-up & return warranty. The recent past shows us that there are very good keyboards (e.g. Ideapad U310) as well as rather poor ones (e.g. Lifebook UH572) that are installed in cheap ultrabooks. Again, our test device benefits from the keyboard of the more expensive UX32VD. 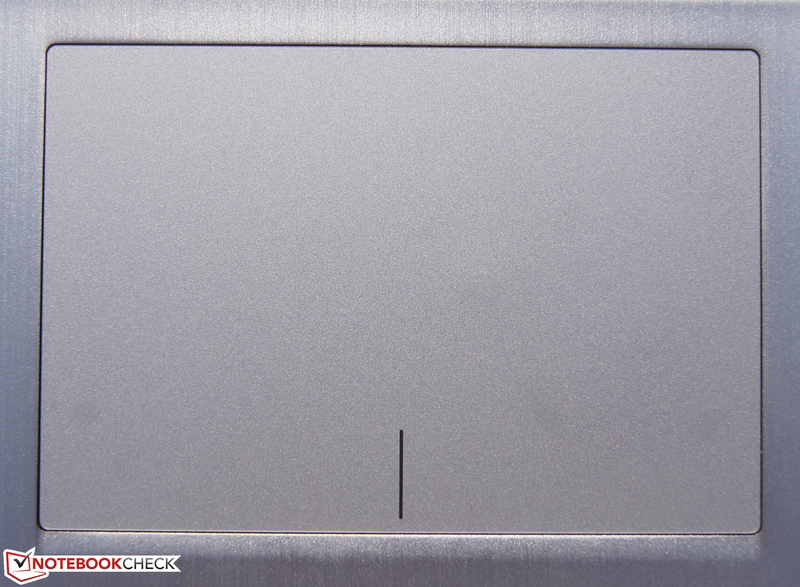 Like in many other ultrabooks, it is chiclet style, features a velvety soft and pleasant surface as well as a crisp pressure point. The keystroke is generous for an ultrabook. However, it has to sooner be described as falling short compared with conventional laptop keyboards. 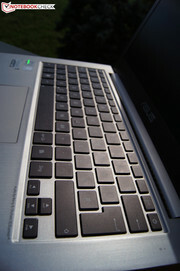 But that does not change anything about the great typing feel that we experienced as we continued to use the laptop. In addition to the keyboard's triple-level backlight, we especially liked the fairly good key drop. Although it occasionally recoils, it is so slight that we can ignore this as a problem with good conscience. The Zenbook keyboard was never a cause for accidental typos during the test. The generously sized touchpad does not feature dedicated buttons. Right and left clicks are distinguished only by the clicked area and assigned to the respective click (the pad's lower edge is marked for this). The velvety and rather smooth surface features pleasant gliding traits and the cursor follows inputs very accurately. The supported multi-touch gestures such as pinch-to-zoom or two-finger scrolling, responded quickly and could be implemented accurately, although not yet on the excellent level of Apple laptops. To summarize, we can say that the input devices belong to the best available in ultrabooks of this price range (another equally good example is the Ideapad U310). 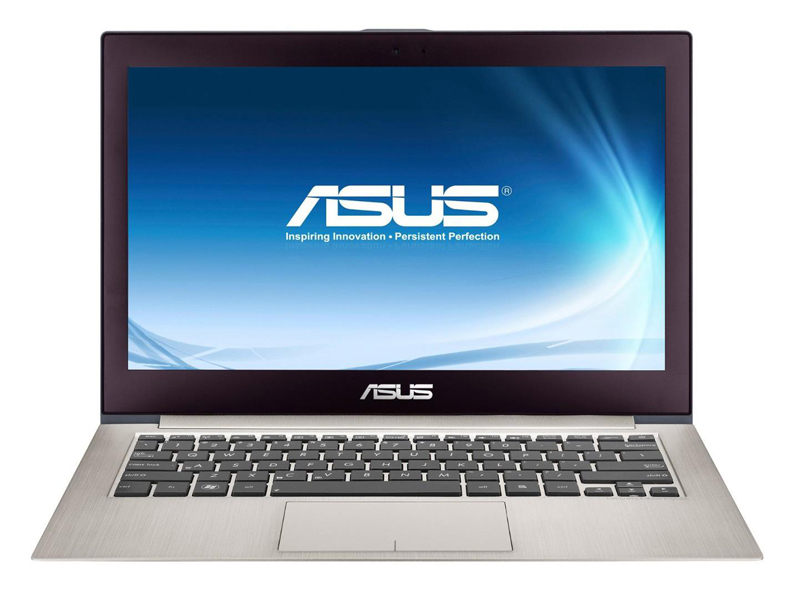 Asus strikes out the Full HD IPS screen in its lowest-end Zenbooks for cost reasons and installs a matte 13.3 inch TN screen with a standard resolution of 1366x768 pixels instead (InfoVision M133NWN1 R1). This cheaper variant should be absolutely sufficient for an ultrabook's routine use. It is quite suitable for outdoor use with a maximum average brightness of 250.3 cd/m2 (but direct sunlight should be avoided anyway). The colors look fairly balanced although a bit pale. The reproducible color space confirms our subjective impression. 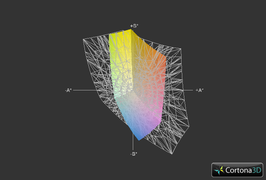 The range of displayable colors is rather narrow (compared with sRGB, see screenshot). Otherwise, the screen is quite convincing. The good black value of 0.52 cd / m2 leads to a very compelling contrast of 513:1. Horizontal viewing angle alterations also lead to very marginal deviations in presentation (slight fading). This alongside the sharp contrast and the good black value result, for example, in a great movie experience. Worse screens are installed in this price range and, with exception of graphic designers, will not make buyers protest. 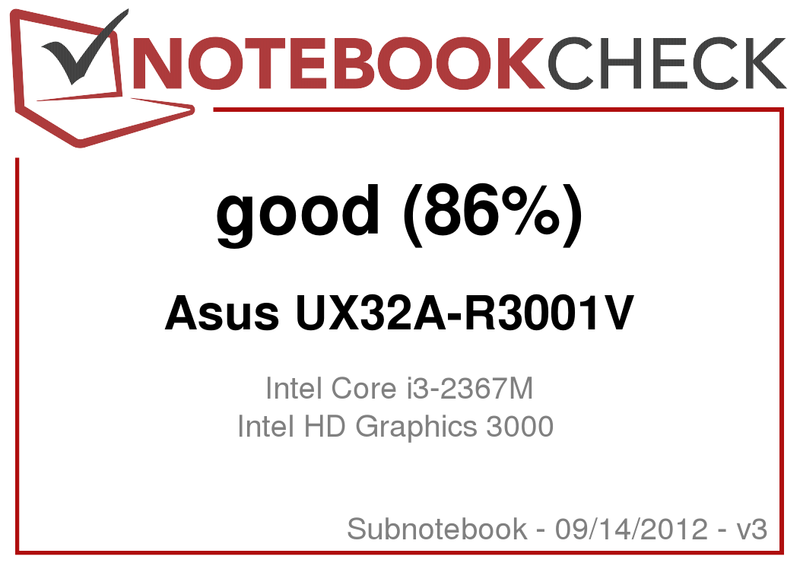 The Zenbook UX32A is the weakest member of Asus ultrabook range. 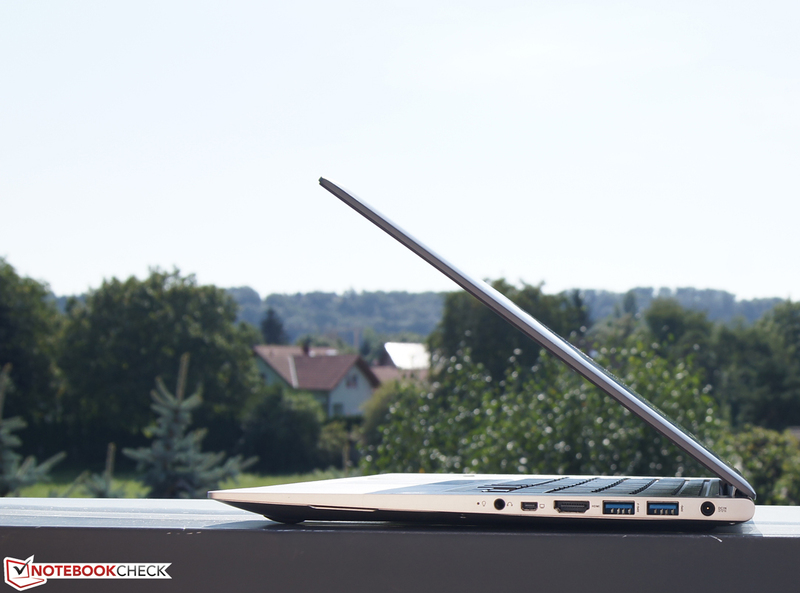 Nevertheless, we believe that it is absolutely suitable for the average tasks expected from an ultrabook. We can browse on the Web or work with Office software smoothly. We rarely notice the laptop's any lags in the performance despite the low-end hardware. Consequently, video editing or compute-intensive applications should be avoided. 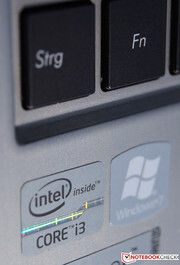 For about 800 Euro (~$1050), you currently get the latest Core i5-3317U (1.7-2.6 GHz, HD Graphics 4000) in most ultrabooks. 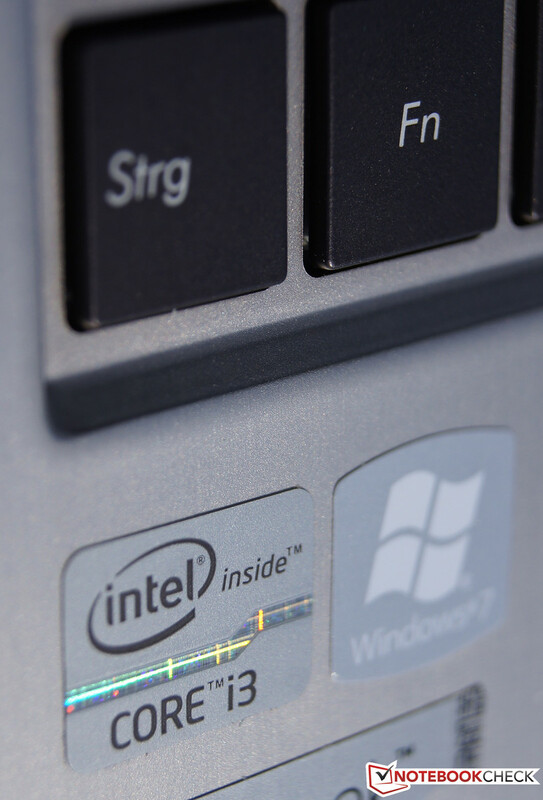 Regrettably, only a Core i3-2367M (1.4 GHz, HD Graphics 3000) from the outdated Sandy Bridge generation powers our Zenbook. 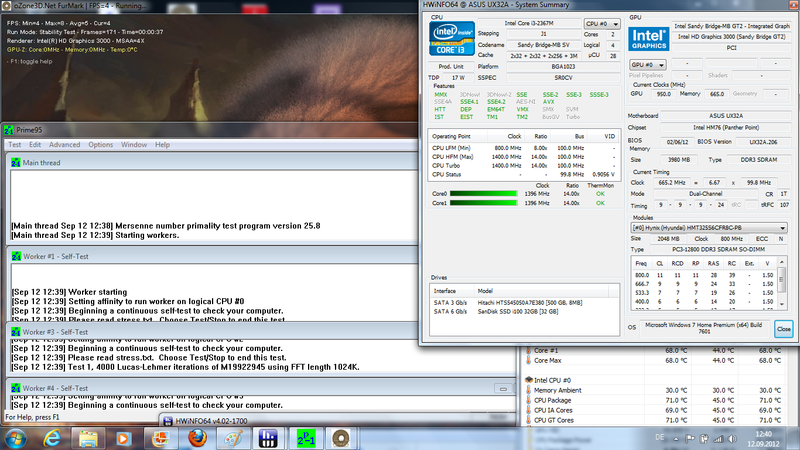 The Ivy Bridge equipped ultrabooks will likely be superior in terms of performance in the following benchmarks. We used the more expensive Toshiba Portégé Z830 featuring the same CPU & GPU in various benchmarks for a better comparison basis. As described above, the Core i3-2367M is not a performance machine. Nevertheless, it easily copes with routine applications including YouTube HD videos. Intel's Hyper Threading technology is implemented, although it lacks Turbo Boost. 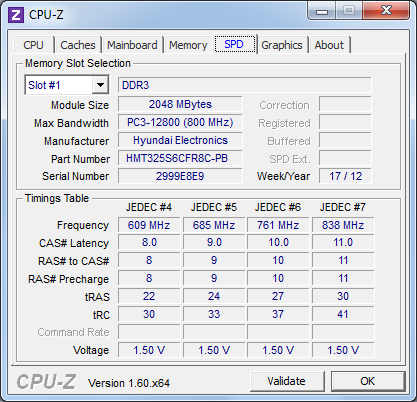 The processor is pinned at a frequency of 1.4 GHz. Our test device is on a par with the equally equipped Toshiba Portégé Z830 in Cinebench R11.5 (multi-threaded). However, it lags behind the Aspire S3 by 82%, trailing the Ideapad U310 by 42% and 20% behind the inefficient Lifebook UH572 (all with a Core i5-3317U). The Turbo Boost missing in our processor propels the competition to a lead of exactly 100% in Cinebench R11.5 single benchmark. So, our low-end Zenbook cannot keep up with the competition in single-core applications. An up-to-date processor would have definitely been beneficial in the slim aluminum device. The system's overall performance is dependent on the installed hard disk. Intel's minimum specifications for the storage device are followed in low-end ultrabooks and fast SSDs are therefore not used. However, the performance advantage compared with our test device should diminish a bit since all the rivals have this shortcoming. Both the Ideapad U310 and Aspire S3 defeat our UX32A by 38% and the Lifebook UH572 takes a 60% lead in PCMark 7. We record exactly the same result in PCMark Vantage. Here, it is simply the faster CPU and GPU combination that has a major impact (Core i5-3317U / HD Graphics 4000) in contrast to our array (Core i3-2367M / HD Graphics 3000). As mentioned above, it is also noticed in general system performance. The competition's value for money proposition is better. By the way, the Ideapad U310 is also available with our processor for 180 Euro (~$235) less. Intel specifies that at least one conventional hard disk must be coupled with a fast SSD cache in the cheapest ultrabooks. It is to store frequently used data and programs and make them quickly available. Hitachi builds our 500 GB hard disk (5400 rpm) and it is supplemented by a small 32 GB SanDisk i100 as the cache, which is often installed in such configurations. It is too small in terms of capacity even if it has a read performance of 309 MB/s in HDTune, but barely any hard disk benefits from it when it comes to measuring the average transfer speed. Thus, it is no wonder that all compared devices are on par with an insignificant difference of just 7% (approximately that of fast conventional HDDs). With roughly 0.5 and 1.1 MB/s for the 4K and 4KQD32, our HDD is on a level with fast HDDs lacking a cache in CrystalDiskMark. The 4K and 4KQD32 read scores simulates the loading speed of small amounts of data. 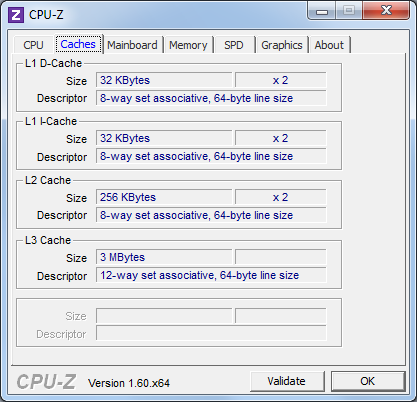 The SSD cache loads small files much faster and supports the conventional hard disk with frequently needed smaller files (e.g. during the booting of the operating system). 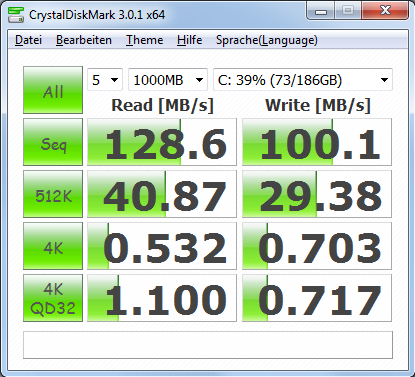 The Ideapad U310 is a paragon in this benchmark (about a 100% faster). If you are accustomed to a conventional hard disk, you will be satisfied with this unit. Our GPU, Intel's HD Graphics 3000, is not the newest unit. 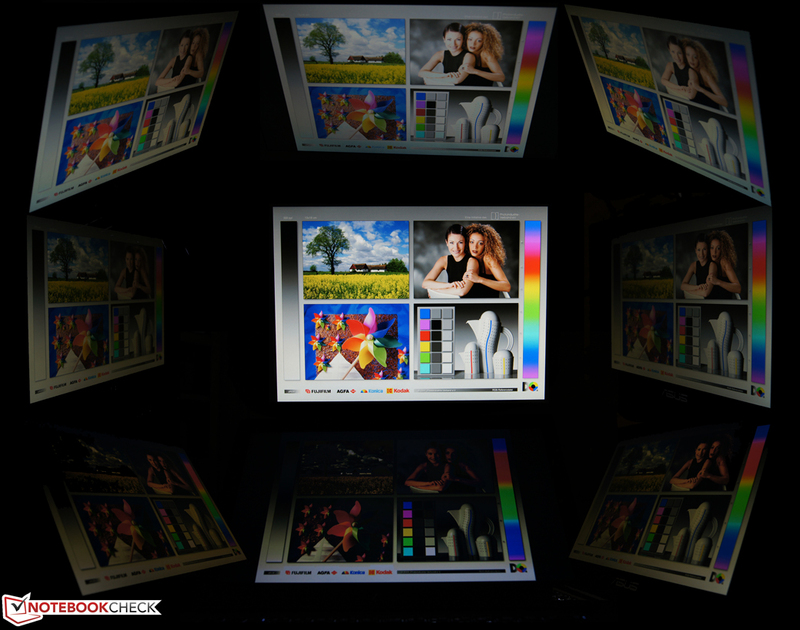 The latest HD Graphics 4000 that is integrated in all compared laptops should render the demanded pixels up to 60% faster across the screen. To make it clear, this IGP (CPU's integrated graphics processor) is designed for energy efficiency. An immense performance difference between the two cards will not be noticed in practical use. Both cards are made for "normal" application scenarios i.e. for Internet browsing or Office tasks. Even HD videos and games (on lowest settings) can be played. However, only configurations equipped with the newer IGP will often clear the hurdle between "playable" and "just playable" framerates. 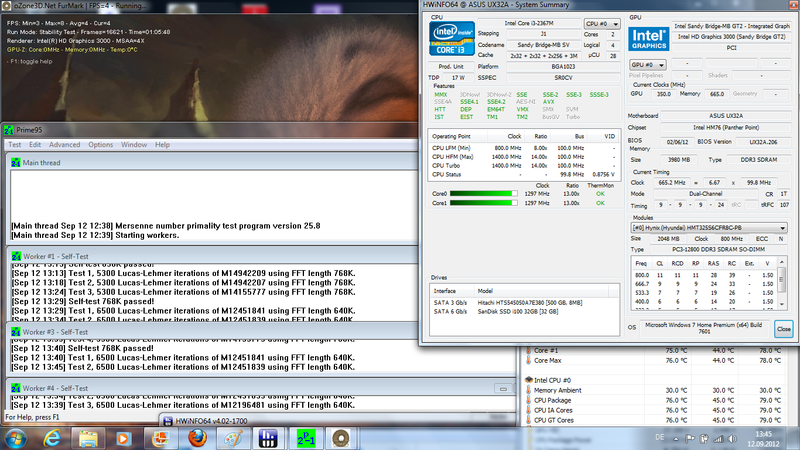 Our UX32A lags behind the Lifebook UH572 by roughly 80% in 3DMark Vantage. The Ideapad U310 and Aspire S3 are also around 40% faster. 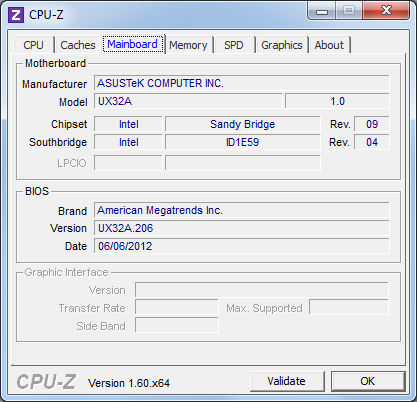 Therewith, the new Ivy Bridge generation's advantage is confirmed. However, our test device takes the first place (of 6) compared with similarly equipped laptops (e.g. Sony Vaio SVT1311M1ES, Toshiba Portégé Z830, Toshiba Satellite L830). Here we see that our Zenbook UX32A is apt for the occasional game in low details. Whether it is Anno 2070 in low details or Fifa 2012 in medium (using a resolution of 1024x768 for both games). The hardware intensive first-person shooter Metro 2033 at a resolution of 800x600 and low details (DX9) is close to being a flipbook with an average of 24 frames. Gaming isn’t going to be fun with all the stuttering going on. Owing to the HD Graphics 4000, the competition frequently mentioned above are up to 40% faster and allows, for example, Annoto be played in medium quality settings. But if you really want to play a game on an ultrabook regularly, you should take the stronger and more expensive sibling of our test device like the UX32VD featuring a GeForce GT 620M. Nevertheless, no ultrabook is designed for gaming and they are meant for other normal workloads. Our UX32A runs quietly in routine use. We measure around 32 dB running normal applications and this condition can be designated as low load (e.g. Internet browsing, Office). A maximum of 37.6 dB was measured during full load. These measurements are very good for the ultrabook sector. 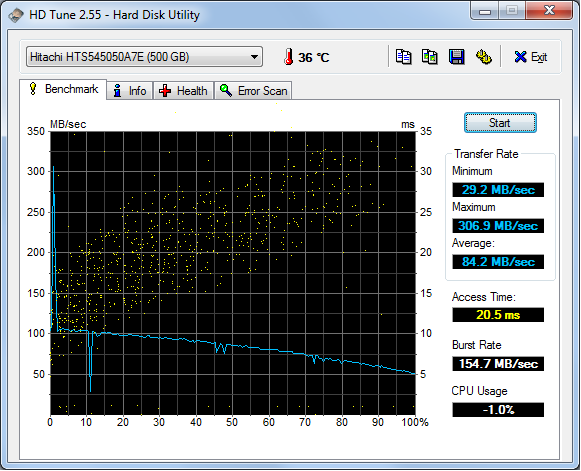 Most ultrabooks are within a range of 40 dB or higher during maximum load. 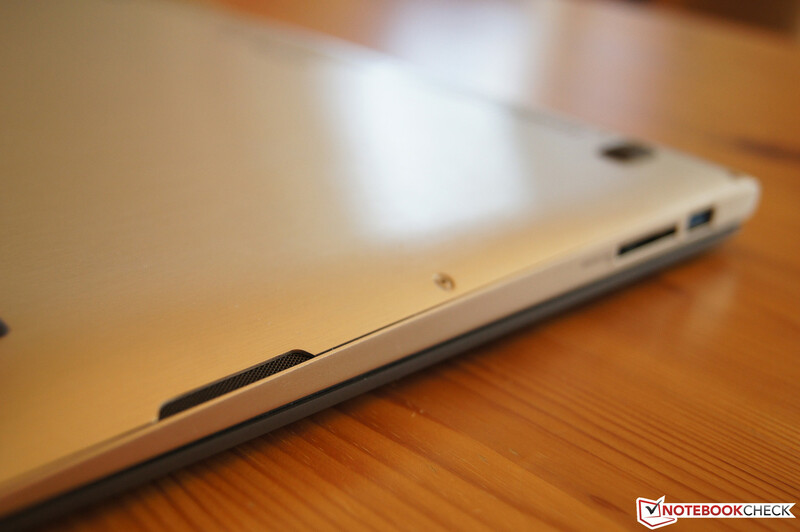 However, we can also recommend the relatively quiet Ideapad U310 for common use in addition to our Zenbook. A look under the UX32A's hood shows the reason for the quiet cooling. This is shown in the images to the left. Two fans and the corresponding heat pipe system has been adopted from the stronger brother without many modifications. 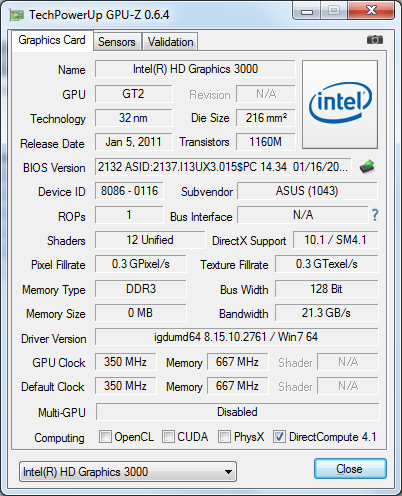 However, the low-end Zenbook does not have tocool a dedicated GPU like in the UX32VD. Consequently our test device does not really get loud even during load. The measured surface temperatures of 32.1°C (top) and 32.9°C (bottom) on average are agreeably cool. Moreover, the cleverly positioned vents on the bottom alongside the fairly large opening angle enable comfortable use on the lap. We recorded a maximum of 47°C on both the top and bottom after an hour of Prime 95 and Furmark in our stress test. That is not a good reading, although these temperatures will unlikely be reached in real use. The core temperature of 76°C is still within an acceptable range. However, a short drop of CPU and GPU clock was noticed. 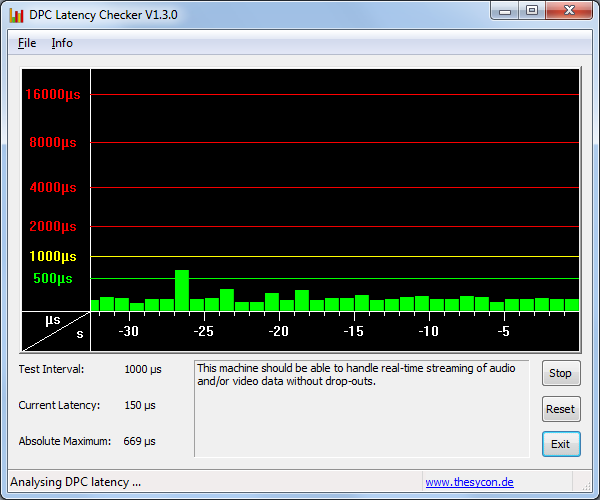 This throttling is almost insignificant (unlike the Aspire S3). It only turned up after about an hour of stress testing in the UX32A (CPU is repeatedly throttled to 100 MHz for a short time), but not while we performed the processor benchmarks. (-) The average temperature for the upper side under maximal load is 39.1 °C / 102 F, compared to the average of 30.7 °C / 87 F for the devices in the class Subnotebook. (-) The maximum temperature on the upper side is 46.8 °C / 116 F, compared to the average of 35.8 °C / 96 F, ranging from 22 to 57 °C for the class Subnotebook. (-) The average temperature of the palmrest area of similar devices was 28.6 °C / 83.5 F (-7.3 °C / -13.1 F). "Audio by Bang & Olufsen ICEpower" made us grin as we opened the slim ultrabook for the first time. We have not heard very good sound from ultrabook speakers until now. Where is it supposed to come from in view of this small size anyway? However, the sound we –heard being played through the small speaker openings could not be more defined, more balanced, clearer or even more enjoyable. Even bass was rendered precisely and balanced, although not extremely powerful. We do not want to spend a lot of time trying to describe the sound. We would recommend you simply go to the nearest electronics store around the corner and find out the truth of our statement yourself. Similar sound quality is unheard of in other ultrabooks in such laptops. With a consumption of up to 13 watts, our UX32A roughly drains 3 watts more than the calculated average of rivals in idle mode. However, we cannot reproach the Zenbook for that when looking closer because the matte screen simply needs a bit more power at maximum brightness. Our test device consumes 40 watts at maximum load which is 10 watts more than the Aspire S3. 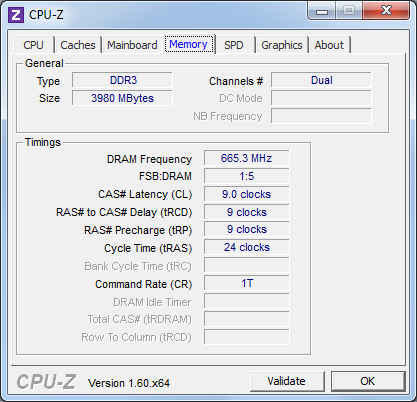 This also often limits the processor clock rate as described above. 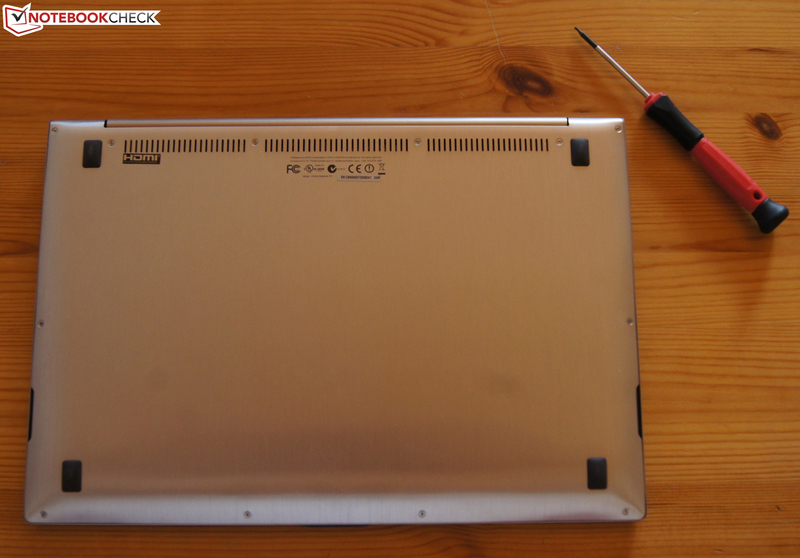 Otherwise, the UX32A is in the higher bracket of the tested ultrabooks. The UX32A is also within the expected range for Zenbooks in terms of battery life. The 45.6 Wh battery lasts for 8 hours 54 minutes in the most extreme case (minimum screen brightness, disabled wireless connectivity, energy savings mode). This could be interesting for users who have to bridge longer periods without an outlet and want to read an e-book on train rides. In our standardized Wi-Fi surfing test, the Zenbook achieves a total runtime of 4 hours 22 minutes at a brightness level of approximately 150 cd/m2 and utilizing the energy saving mode. That is in the Ideapad U310's vicinity (4 hours 17 minutes) and ahead of the Aspire S3 (3 hours 58 minutes) as well as Fujitsu's Lifebook UH572 (3 hours 17 minutes). 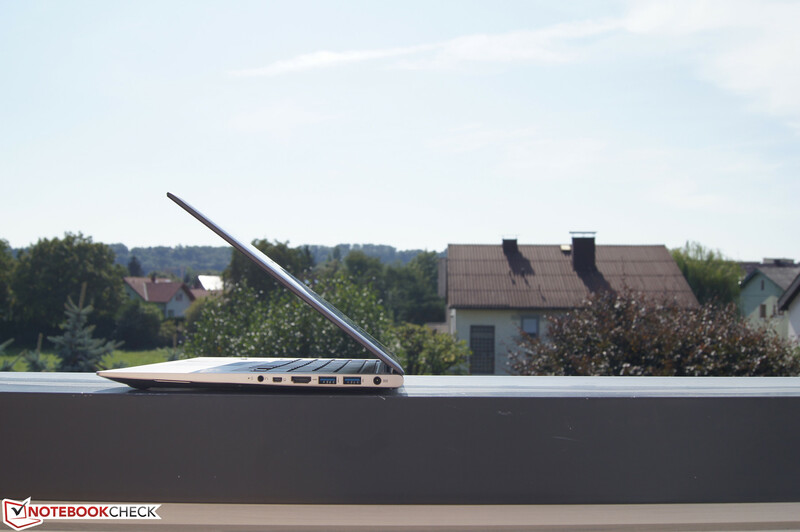 The 13-inch MacBook Air is the leader of the ultrabooks with a runtime of 6 hours and HP's Folio 13 is the best performer in the low-end sector with over 5 hours of runtime. With 2 hours and 46 minutes of runtime, our test device is able to beat its rivals in the BatteryEater Classic benchmark where load and high performance settings are simulated and the backlight is set to maximum. The competition gives up about an hour earlier than the UX32A. Ultrabook fans have a decent machine offering good mobility. An affordable, well-engineered and elegant ultrabook. If it only had the newer processors. 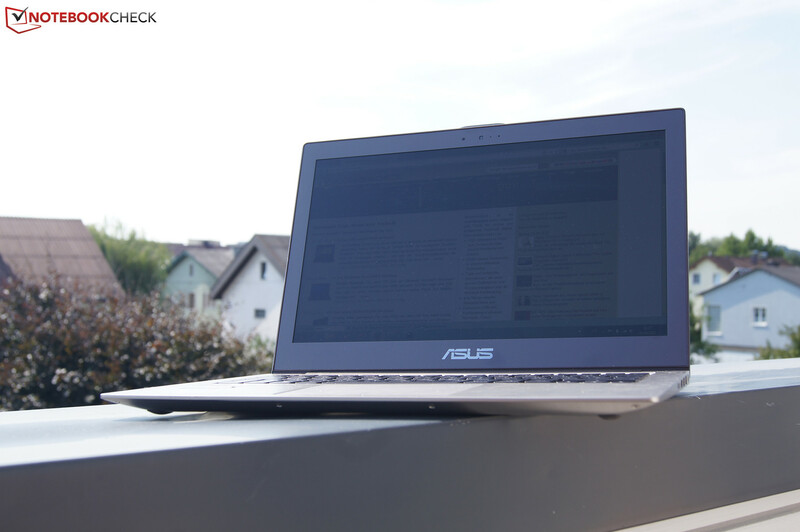 So, how successful is Asus' 800 Euro ultrabook project? The customer is doubtlessly given a lot of extras for this price point. The slim, very well-built and rigid case is not unibody construction like in the UX31A. However, it is comprised of an aluminum-plastic composite that was adopted from the UX32VD just like the excellent Bang & Olufsen speakers and the sophisticated, extremely quiet cooling system featuring 2 heat pipes and 2 fans. The 13-inch TN screen has surprisingly good contrasts (due to a very good black value) and sufficient viewing angle stability. A brightness of 250 cd/m2 alongside the solid battery life of over 4 hours should reassure all ultrabook fans. 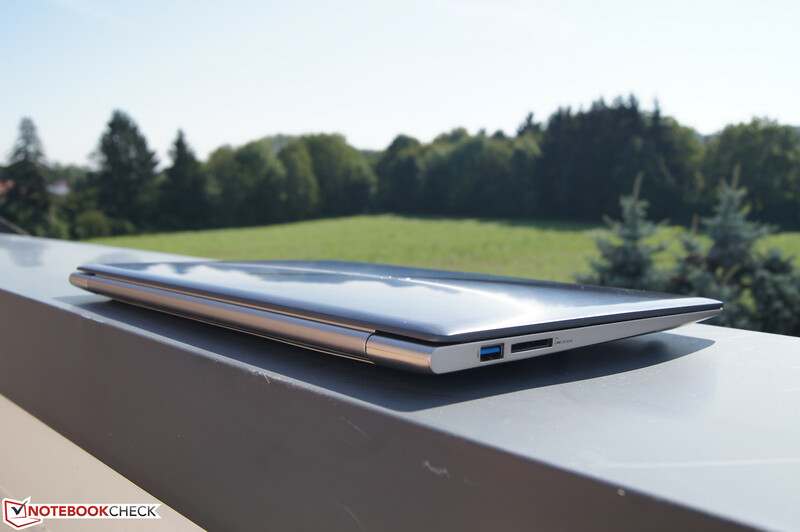 Asus shows us that it is possible to create portable and yet inexpensive ultrabook that can be used outdoors and is affordable. However, Asus had to make cutbacks in other areas to keep the cost of the laptop down. 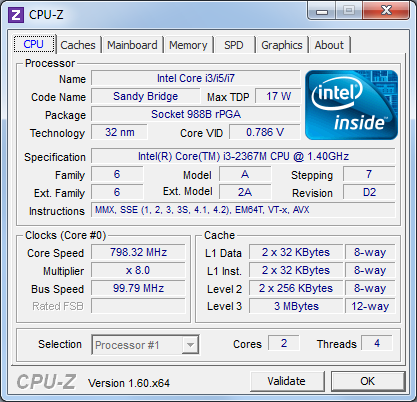 For example, the OEM has included a comparatively weak and outdated Sandy Bridge Core i3-2367M processor (2x 1.4 GHz) instead of the more expensive Ivy Bridge processors. This CPU is available in Lenovo's Ideapad U310 for 180 Euro less. For a price of around 800 Euro, almost every other ultrabook rival installs the considerably faster Core i5-3317U, which benefits from Turbo Boost (2.6 GHz maximum) to such an extent that some ultrabooks are twice as fast as our test device in certain benchmarks. That is unfortunately true in real world workloads and just not in the synthetic benchmarks. For example, we noticed unusually long delays before installations or executing benchmarks in the test. It is certainly not only the processor's fault but that of the hard disk as well which is not much of an issue. Nevertheless, we question its long-term suitability. The competition proves to be faster in almost every case. We are probably nit-picking here. The ultrabook user gets what he should expect from a 800 Euro device- an elegant, lightweight, rigid case, good input devices, a matte screen and satisfactory battery life. As a special treat, movies feature high-contrast pictures and music is rendered via the good speakers. If you are looking for a fairly affordable, well-designed travel companion rather than a high-performance machine, you can take the UX32A without hesitation. However, we would recommend comparing the competition listed on the right and a look at our top 10 subnotebook chart. 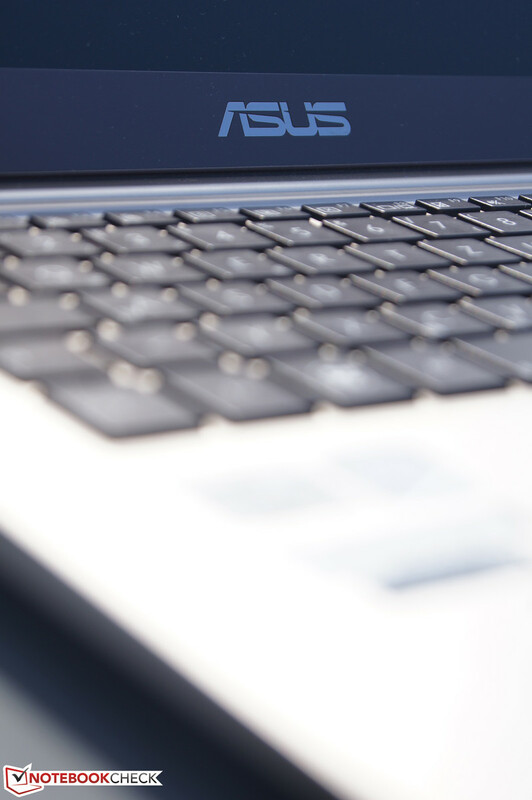 The UX32A is a well-engineered, elegant ultrabook without major shortcomings. ... we find small speakers that supply unexpectedly good quality sound and even bass (though not very powerful). The sophisticated cooling system consisting of 2 heat pipes and 2 fans pleases because of a fairly low noise output. allows accessing the entire hardware after removing 12 Torqx screws (RAM and HDD may be changed easily). 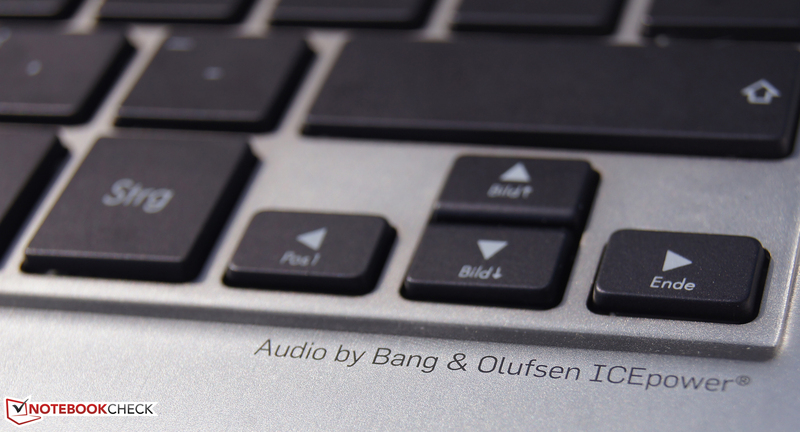 The impressive sound is supplied by Bang & Olufsen and is extremely high-quality and rarely heard from other ultrabooks. Beyond that, it also provides a multi-level backlight. Typing on the chiclet keyboard is very pleasant. The design language is impressive for this price range. It can be opened to a maximum angle of 130°. The narrow hinge holds the screen firmly after an initial wobble which only lasts a moment. The slim aluminum casing pleases with its deceptively fragile design. and our affordable member of the family, the UX32A, does now too. The weak processor is unfortunately only apt for routine tasks such as Web browsing and general productivity. The rigid, stylish, well-manufactured casing, the good input devices and the quiet fans. Also, the sound quality that is likely to remain unbeaten by other ultrabooks. 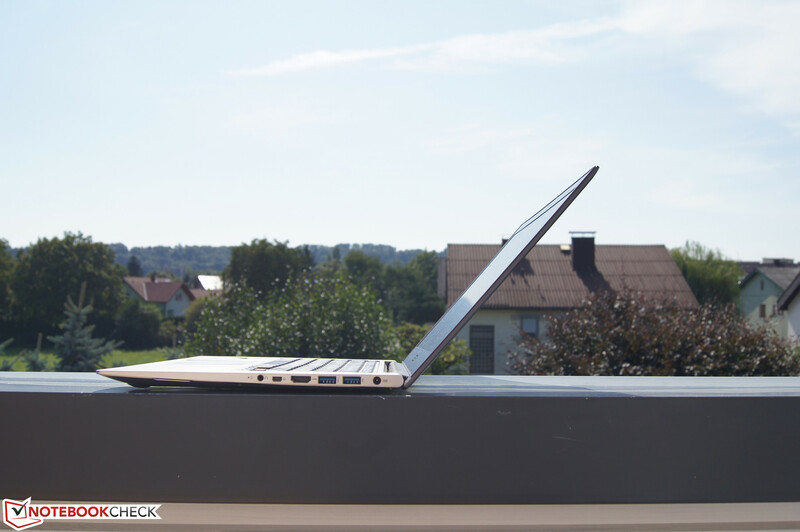 And finally, the mobility and outdoor suitability of the ultrabook in this price range. The latest processor that would not arouse doubt about its long-term usability in us. 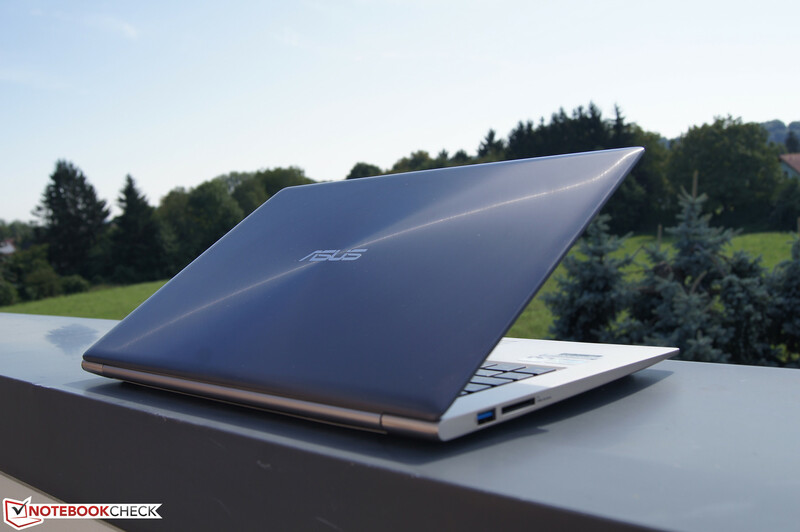 All the premium features that Asus packs into the Zenbook UX32A. Moreover, it is hard to find such well-engineered, balanced ultrabook for around 800 Euro (~$1050). Lenovo's Ideapad U310, Acer's Aspire S3, Fujitsu's Lifebook UH572. The more expensive HP's Folio 13 featuring an SSD and longer battery lifeReview HP Folio 13-2000 Ultrabook.